The Leathermans liked what McKenzie had done with her own house on a windswept section of the rugged Sonoma coastline and asked her to incorporate some of her unusual design ideas into their bathroom. The talented artist, whose background is steeped in textiles and weaving, had begun exploring design possibilities using industrial materials and simple objects as prototypes for residential installations. For the Leatherman’s bathroom, she designed a stunning countertop from a solid slab of concrete, using exposed copper piping for legs and support. McKenzie also designed a stainless steel vanity mirror, which reflects the charcoal gray marble tub and dramatic windows, making the room appear much larger than it is. 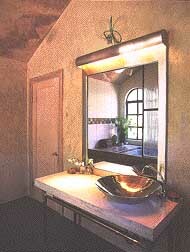 The mirror has concealed lighting which casts a rich glow on the sink. “I initially thought of using a wok, but I think this bowl is really effective and it has a beautiful gleaming finish, which acts as a good contrast to the solid concrete slab,” says McKenzie, who applied her artistry to walls and ceilings. She painted a faux marble glaze over the rough plastered walls. The effect is both elegant and sophisticated. The Leatherman’s had never solved the problem of what to do about a shower screen. They didn’t want doors that would detract from the windows, and the tub, but they needed something to prevent excess water from spraying all over the floor. “Dianne designed us a superb shower screen in fluted glass,” says Sandi.